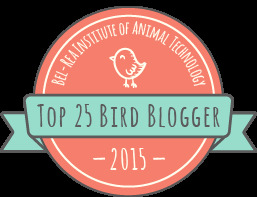 Philly Bird Nerd : Imagine My Surprise! I had "one of those days" today. A Snowy Owl was reported at Sandy Hook NJ yesterday. 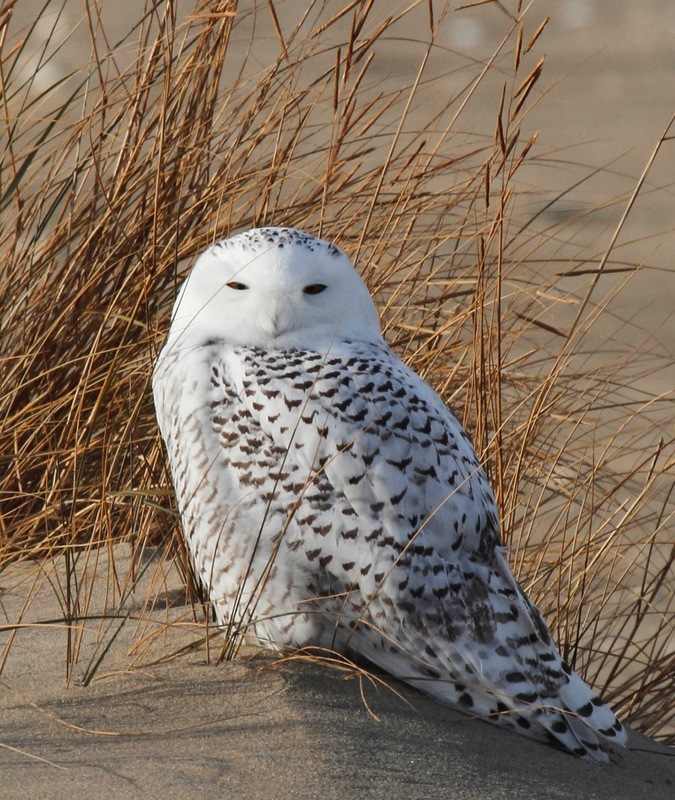 Snowy Owl is one of those birds that is mythic. It is rare outside of the arctic. It is regal. It is powerful. It is awesome. I am drawn to it. Reports were scattered. Some said that they owl was on the beach, others said that the bird was on the move, and still others said that the bird was gone. I resolved to see the bird this afternoon if anyone reported it. So, at noon I left the office and headed north on I-95 to Sandy Hook which is the northern most beach in NJ. 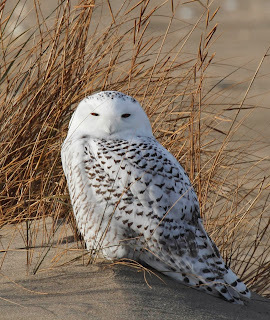 My friend Harvey called to say that he hadn't heard anything about the bird and that it was pouring rain so I turned around and headed south to the shore Just then, a text message came in stating that the owl was indeed at Sandy Hook. You guessed it, I turned around again and headed north. I arrived at Sandy Hook 2 hours later and hoofed it a half mile out through the sand dunes to the northern tip of NJ with binoculars, camera, scope and tripod. I emerged from the dunes to see 4 people standing with binoculars. One of them was waving frantically and yelling "There's 2, there's 2! There's 2 owls here!" You gotta be kidding me. 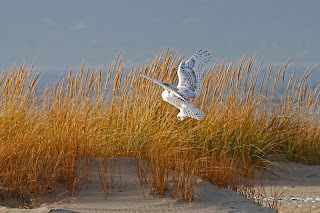 2 Snowy Owls in NJ in Nov. Impossible. Yet there they were - sitting on the beach. My birding friend Alyssa was there too thanking me for having a scope. We set it up and got great views. I also took some photos. You can see 1 white spec in the center and another one to the right of that on the horizon. Those are the owls. 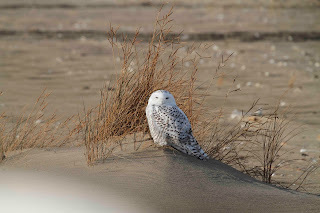 The day got a little better when the sun appeared and made the owls glow against the sand. We were standing pretty far away from the birds. There was an orange fence on the beach with a sign stating something like "Construction Zone - Keep Out". As we stood there, a guy with a camera goes walking out past the fence right toward the owls. I whistled and yelled "YO! Get away from the birds!" (I yelled that a few times and might have had some other choice words mixed in). He stopped and walked toward us. It was only then that I noticed he was wearing a park ranger uniform. Uh-oh. He came over and said that he was trying to get the birds to come closer. What?!?! Nevermind. Then I got ballsy and asked the ranger if the rest of us could get closer too. He said he was leaving and we could do whatever we wanted but that Jeanie was still on duty. We took that to mean "Yes, you can get closer" so we did. We stayed together and walked slowly along the dune stopping every 50 feet to make sure the birds weren't spooked. Then, the guy in the white pickup truck (see photo above) came after us. He isn't a park ranger, he is a security guard for the construction company. We ignored him until he got out of the truck. I told the group that I would handle it (fully expecting to be arrested or something). The security guard said that we were in a restricted area. I immediately said that the ranger gave us permission to go along the dune to see the owls (again, expecting to be escorted off the beach in handcuffs). All he said was "Oh, OK". I asked if he wanted to see the owls through the scope. He was amazed. We were in like Flynn. Annie and another guy named Greg showed up met us in the restricted zone too. Then Jeanie showed up (gulp). She is a real park ranger biologist and knows what's what. I thought we were doomed but she was totally cool with us being there. I guess she saw how careful we were being and figured that it was OK for us to bend the rules a bit. She told us that she had a group of Intellectually Challenged kids on the beach to see the owl earlier and it was actually one of them who noticed the second bird. Way to go! And then, the most amazing thing happened. Jeanie put us all in her truck and drove us closer to the owls. Check this out. The first photo is not cropped at all. The blur in the bottom left is the side mirror of the truck. The owl just sat there and looked at us. They aren't afraid of trucks or cars which allows us to get pretty close. This is the same photo cropped so you can see her markings. Yes, it's a "her". You can tell that this is female because she has black spots. Males are almost completely white. The other bird also appeared to be a female. I wonder if they are sisters. 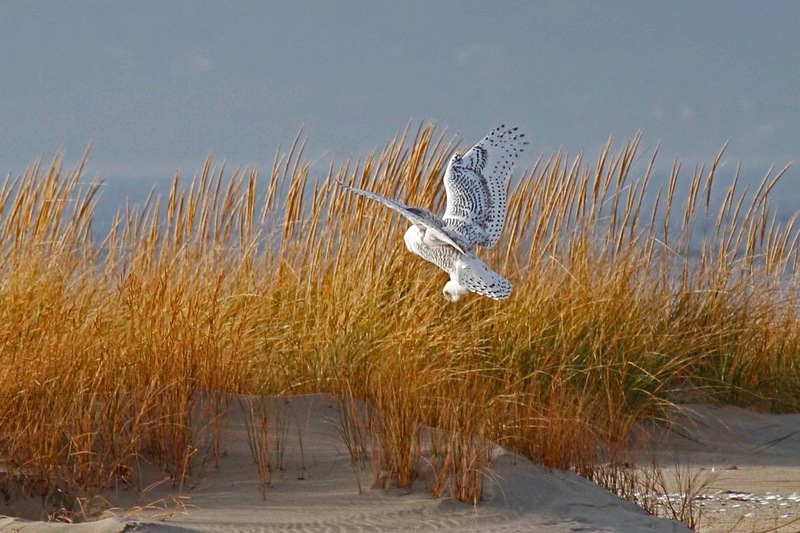 She finally decided to fly to another clump of dune grass. I have a few photos of her in flight but this one is the best because it shows her furry feet. Snowy Owls are one of the few (if only) raptors that have feathers all the way down to their feet which makes sense to keep them warm. Jeanie (who is now known as the best ranger ever) took us back to our starting point and headed out to do her real job. I vowed to send her these photos to post on the Sandy Hook website. We all just stood there in awe for a few minutes and then I just started yelling "I can't believe it, I can't believe it". I almost cried for joy. 2 Snowy Owls. I still can't believe it. Linda, can I just follow you around some time? You have the best luck out of anyone I know! Unfortunately, others were not so lucky. Friends have told me they were, in fact, chased off the beach by rangers or security guards or whatever. Your photos are stunning. Your birder vibe/Karma must be pretty darned good. I'm so glad you got this bird! Photos are incredible, as is your recounting of the experience.